Hi Guys!! I hope you all are good. Cracked heels are a major problem for people who have them. From having just few cracks, the situation can worsen and it can turn in to a huge source of embarrassment and pain for the victim. There are many causes of cracked heels, the first and the foremost being improper foot care and diet. Weather changes and dry air also cause the same, so giving your foot proper care and a makeover is not only necessary to make them look beautiful but also important to avoid serious complications such as chronic fungal infections, lymphoedema – a condition that causes swelling in a part of the body because of fluid build-up under the skin. Even though this problem can be easily managed and treated at home by using foot creams, coconut oil, vasaline etc, it should not be ignored and taken lightly if the cracks are too deep or painful and medical supervision should be taken at the earliest. 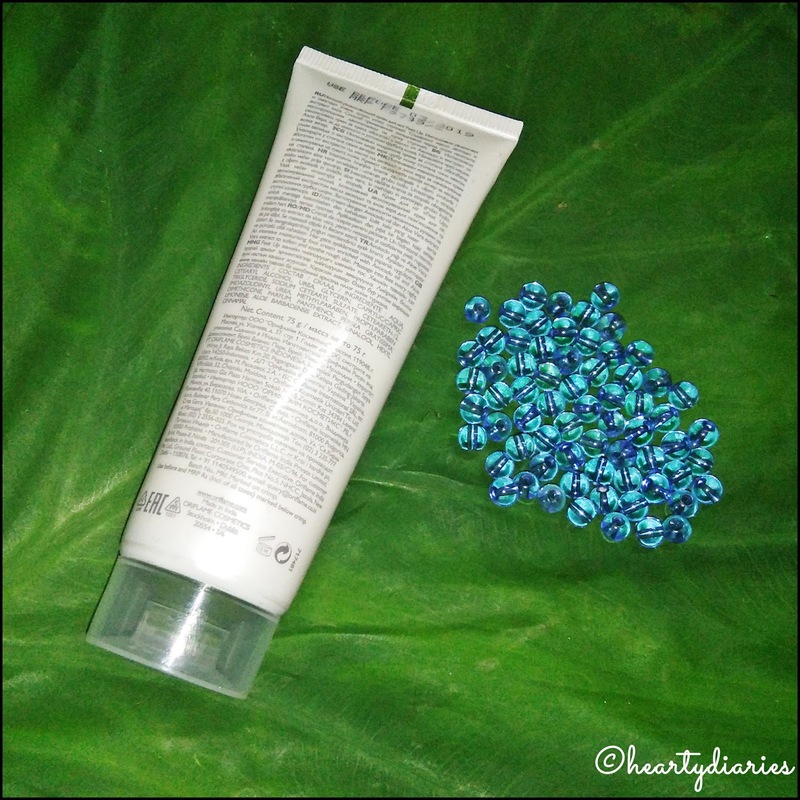 These days there are a lot of foot creams in the market and today I am reviewing one such cream in my happy place! Please keep on reading this review till the end to know my full, honest and unbiased opinion based on my experience but don’t forget to comment and let me know if you like or dislike, agree or disagree with this review or have something else to say! Feet Up provides foot care products for your entire family, offering general and advanced care products formulated especially for you to achieve soft, smooth and supple feet. 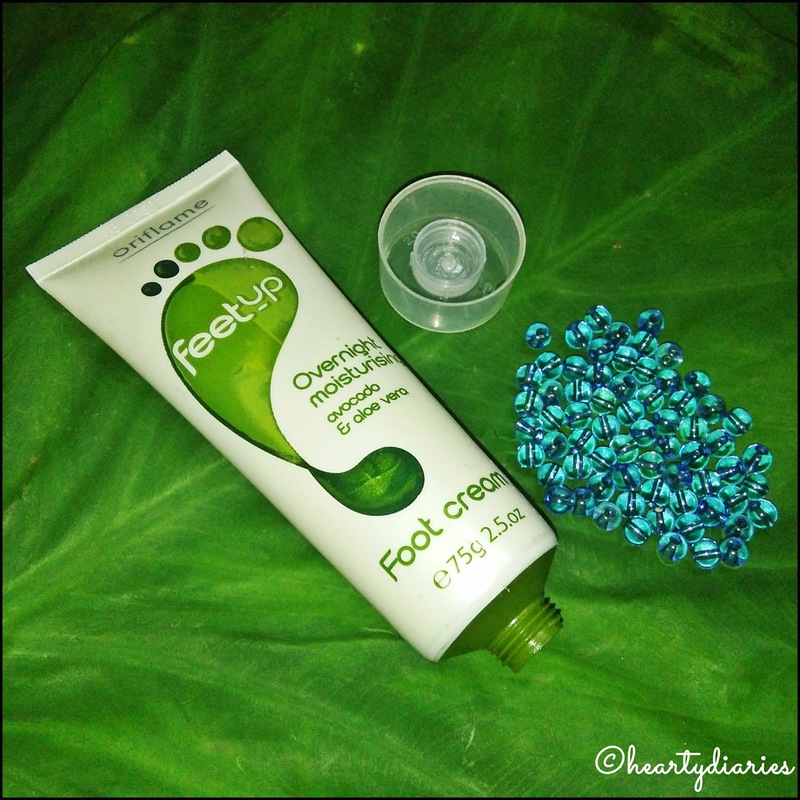 This range provides a complete foot care routine to pamper, care and invigorate tired feet. Repair cracked heels in 7 days and get softer, smoother feet with this fast acting foot cream. Vitamin B5: Acts as a moisturiser increasing the moisture level in the skin, leaving the skin feeling more conditioned. 10% Urea: Is the best natural moisturiser. Its ability to capture water reduces the thickness of the horny layer and restores the normal hydration process. Cost: Rs. 349 for 75 ml or 2.5 fl.oz. Packaging: This foot cream comes in a soft, white colored, rubber tube with green detailing and has a white-transparent screw cap. A lot of information in different languages and ingredients list is mentioned at the back. The packaging is overall sturdy, light and travel friendly. Texture and Consistency: This cream has a white colored creamy texture and the consistency is quite thick. My Experience: The Oriflame catalogue claims this product as a soothing foot cream to improve feet overnight. 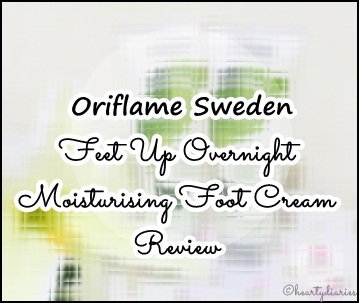 To pamper my feet, I first used Oriflame Sweden Feet Up Advanced 2 in 1 Deep Action Foot Scrub in the day time and had quite a satisfactory result except for the fact that its smell was overpowering. Later, I applied this cream on my feet at night keeping the same positive result in mind. Its smell is also strong but lesser than that of the scrub. The cream has a thick consistency but doesn’t feel sticky or heavy once applied. It gets absorbed into the skin easily. I applied it on my feet thoroughly and massaged it really well. Next morning, I got the result I expected. My feet felt really soft, smooth, pampered and groomed. I don’t have cracks but my mother has a few, so I wanted her to try this out as well so that I could see its impact on what it is basically meant to do. She too applied this cream at night and found really soft and groomed feet in the morning, however the cracks were the same. She applied it again next night and the second morning, we could see that the cream has worked well. She applied this cream continuously for five days to completely get repaired heels. I don’t believe in expecting amazing results overnight but this cream starts working overnight. It takes around three-five days to completely work but its worth the time. My housemaid has really deep cracks on her heels which hurt her a lot, so I’ve given this cream to her as well. She has been using it for three days now and there is a very little difference, but there is a difference. Overall I’ll say that this cream works but the results depend on the intensity of cracks. Yes. I am quite satisfied with the results and would repurchase it for sure. Yes. I highly recommend buying this foot cream even if you don’t have cracked heels and just want to have groomed and pampered feet. Yes. This cream really works well and is worth the money charged. Final Verdict: I am overall happy with this experience but I just wish the smell factor was improved. So that’s it for today guys. I hope you all liked the review. Don’t forget to comment down below and follow my blog..
Nice review dear… even i hate products wd overpowering smell…. I have never tried any Oriflame products except their face wash. This foot cream looks really good. Except the fact that it contains parabens. Thank you for stopping by dear! I would love to read your review..
Oriflame products are quite good but some of them are really dissapointing.. I just wish they launch paraben and cruelty free products! !